Dr. William Shore’s father, Dr. Thomas Shore, was a veterinarian and William helped out in the office from the time he was 10 years old. He learned a great deal from his father about the day to day life of a veterinarian. Dr. Shore attended the University of Missouri; graduating in 1979. He was a member of the student chapter of the American Veterinary Medical Association. After graduating from veterinary school, he practiced for two years at North Park Veterinary Clinic in Evansville, Indiana working for Dr. Jerry Smith and Dr. Howard Nelson. In 1981, he moved back to St. Louis to join his father in practice. His father had two clinics and William worked at the Grantview Animal Hospital in South St. Louis County with his father’s partner, Dr. Gary Gass. In 1985, Dr. Gass left to go back to his hometown of Collinsville, Illinois. Dr. Shore ran the Grantview clinic in partnership with his father at Brentwood Animal Hospital. In 1992, his father retired and along with associate, Dr. Jim Ryterski, Dr. Shore and Dr. Ryterski purchased the Brentwood clinic. In 2004, they merged the two clinics and his associate, Dr. Steve Finch became partner also. In 2005, he moved the Brentwood location to build a new clinic which was completed in 2007. They have recently sold the practices to Blue River Pet Care. He currently continues to practice at Brentwood Animal Hospital in Brentwood, Missouri, but plans to retire in December of 2017. 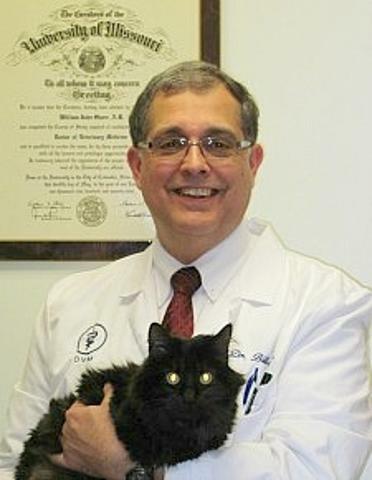 He was honored by the St. Louis Magazine as a Five Star Veterinarian in 2010. He has been married to his wife Janet for 40 years. They have three children and six grandchildren with number seven due in January of 2018. He was nominated to the Missouri Veterinary Honor Roll by the Missouri Veterinary Medical Foundation Board and enjoys serving on the board immensely. Leave a donation to help the foundation in honor of William Shore.